We knew going into this photo shoot that we would be competing with many beautiful of images of this lighthouse. Portland Head Light has literally been photographed hundreds of thousands of times. So, in order to present something new, we decided to focus less on the lighthouse and more on the entire scene. Getting a shot this wide required the use of a convex lens (hence the slight horizon distortion). Still, I think the wrap-around effect this produces on the cove is well worth it. This is one of those pictures that needs to be seen and printed BIG to fully appreciate! 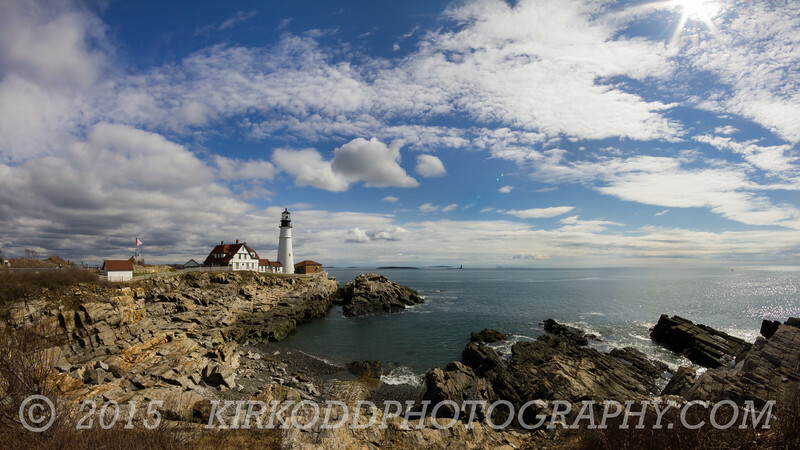 Portland Head Light is one of the most photographed lighthouses in the world. Located on the grounds of Fort Williams Park in Cape Elizabeth, Maine, this lighthouse attracts thousands of people each year. This historic landmark was first lit in 1791, and remains to this day a functioning aid to navigation.